The backstopper faced a barrage of Capitals shots throughout the contest, including 35 over the final two periods. STAT PACK: Murray made 47 saves on 49 shots as the Pens were outshot in every period. He finished the game with a .959 save percentage. PRAISE FROM THE OTHER SIDE: “I thought he was the reason they had success,” offered Washington coach Barry Trotz. 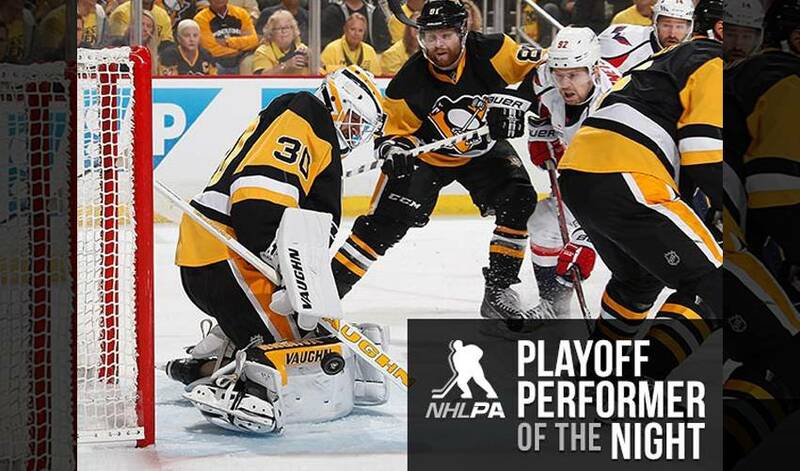 THE PUCK STOPS HERE: Murray, who made at least 14 stops in all three periods, became the third Penguins goaltender to make 47 or more saves in a regulation game during the Stanley Cup Playoffs – and the first to do so in a winning effort. SUPER STATS: Murray moved to 5-1 with a 1.79 goals-against average and .944 save percentage and one shutout since taking over the Pittsburgh net in Game 3 of the First Round at the New York Rangers. He owns a 9-2-0 record in 13 career appearances during the regular-season (2.00 GAA, .930 SV%, 1 SO). HOME IS WHERE THE ‘W’ IS: Murray improved to 6-1-1 in eight career appearances at CONSOL Energy Center (regular season and playoffs), where the Penguins have won 19 of their past 24 contests dating to January 17. TROPHY TRIO: In 2014-15, Murray won the American Hockey League’s Harry Holmes Memorial Award (fewest team goals allowed), Dudley “Red” Garrett Memorial Award (Rookie of the Year) and Baz Bastien Memorial Award (AHL Best Goaltender). NO. 83: Murray was selected 83rd overall in the 2012 Entry Draft. Other players of note taken in the same spot include Matthew Barnaby (1992, 834 NHL games), Joe Corvo (1997, 708 games) and Anton Stastny (1979, 650 games). HONOURABLE MENTIONS: Carl Hagelin scored Pittsburgh’s third goal of the game. Eric Fehr recorded four hits. Sidney Crosby went 15-7 in the faceoff circle. Alex Ovechkin had one goal and one assist for Washington.